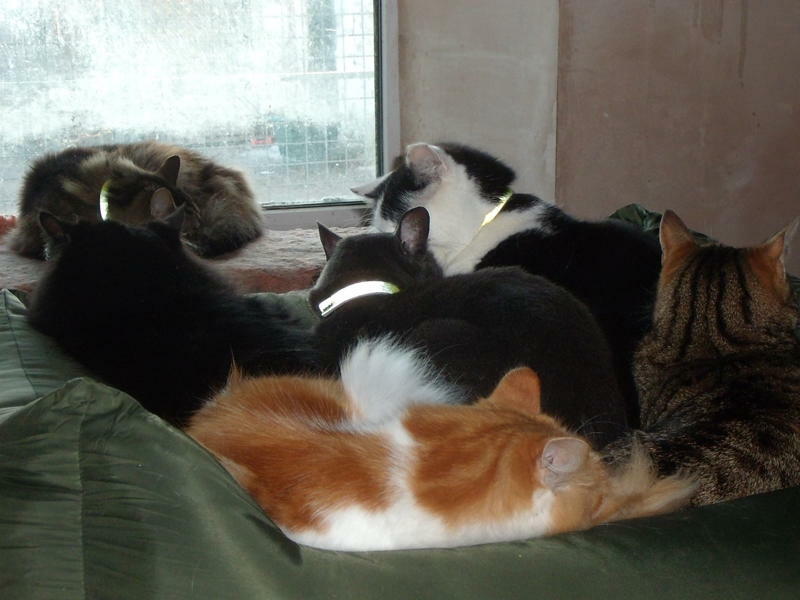 Ark on the Edge has many resident cats, that for one reason or another cannot be rehomed. Last count there was almost 20! And these guys don't sleep outside or in chalets, oh no, they are much more comfortable living in the house! So below are just a few of our permanent residents, if you pay us a visit, chances are you'll see one of these guys having a wander around the place. 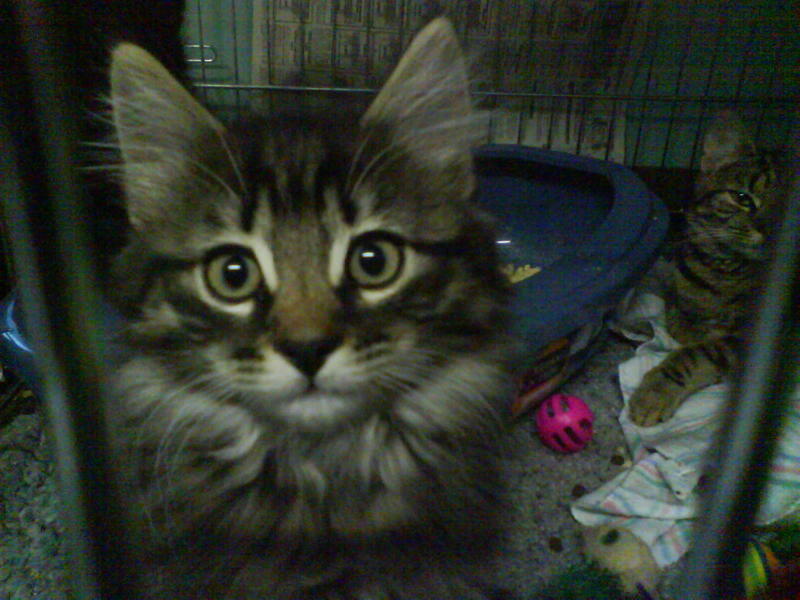 MOFFAT - This is moffat and he was brought into the centre after being abandoned, and he is our resident bird catcher. He is now getting on in his old age, but still likes to go outside and try his luck on the bird table. BLUE - If you've visited us before, then this will be perhaps a familiar face. Blue was found as a stray by the owner, and he now lives here permanently! He is an extremely handsome gentleman, who instantly greets visitors for hugs. He is the boss of the all the other cats that live here. In fact, he is far too distinguished to hunt mice, he settles for taking prey from the other cats! Mind you, if you have food, make sure its safely wrapped in your bag, as Blue has been known to get inside bags and take out sandwiches for himself! He contents himself to being in the centre, either lying on the radiator or snuggling in someones jacket. If you see him, expect to be pestered until you give him the attention he deserves! KIT - This is Kit, a long haired ginger and white male and he lives here with his litter mates including his identical twin Two Tips. Kit is our resident mouse catcher, and frequently brings these little 'gifts' back to us. He loves to be outside and you can hear him meowing if he can't get outside. Although he doesn't like the wind and high tails it straight back to the house if a large gust catches him. He is very friendly if you see around. PUSS PUSS - Puss puss is an adorable jet black male. He was originally found by the owner as a feral cat and it took 18 months of hard work and a heck of a lot of T.L.C to even get him to come near people. He is called his 'unique' name because this was the only name he would ever respond too. Now, he is extremely friendly and can be seen lounging in the garden, watching the world go by, although he does seem to have a nasty talent for going after rabbits. If you see him around he is very very friendly and will love to come and get some attention. BLACKY & SPOT - These are just two of many house cats. They live inside, so you won't see them out and about, but on nice days, they can be seen in their outside run connected to the house. Chilling after a hard days work!